Sometimes Foodie: Panera's French Onion Soup is back! Does it taste the same? 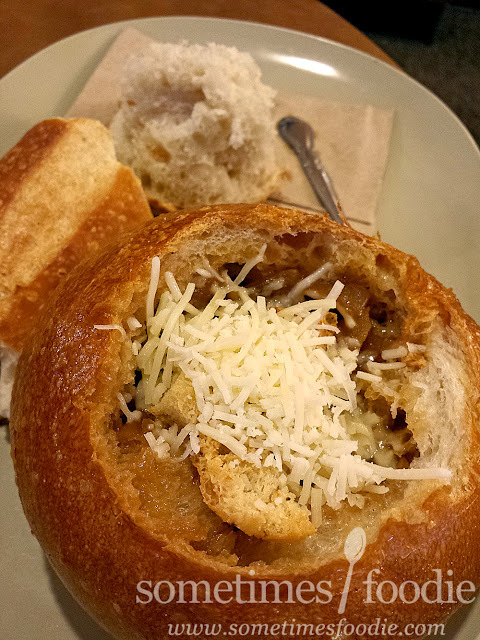 Panera's French Onion Soup is back! Does it taste the same? A few months ago Panera removed a bunch of their beloved menu items and people lost their sh*t.
Among the items removed were the whole grain baguette, the Chipotle Chicken sandwich (one of Panera's only spicy offerings), and their French Onion Soup. When I was in college I worked as a trainer at Panera bread for several years, and I saw a lot of products come and go, but these things were menu-staples! I would sell countless Chipotle sandwiches everyday, we had customers who only came in for those whole grain baguettes and modified their sandwiches to come on them, and that soup? That was an every-freaking-day soup! What in the world possessed them to remove it? According to their press release, they wanted to expand their menu offerings, while also making all of their menu items all natural and "healthy." Now I'll admit, there was nothing healthy or natural about that spicy chipotle sauce (although it was damn tasty), but the soup? Removing that soup broke my sister's heart. She's been ordering that soup (in a bread bowl) for as long as I can remember, and she very rarely ever ordered anything else. When I found out that it was finally back, and reformulated, I had to take her to Panera to find out if this new version was as good as the one she's been ordering ever since we were kids. The new "Bistro" version that's now available is available every say except Saturday for some bizarre reason (which of course is the day I originally planned on getting it for her), and it now comes with black pepper focaccia croutons and Gruyere cheese. Since my sister was the unquestioned Panera French Onion soup expert, I bought her a bread bowl to celebrate it's return (and to slightly guilt her into writing a guest-review for the blog). So here's what she had to say about the soup and how it compared to her beloved original. The old French Onion soup was my favorite comfort food. When Maria told me it was discontinued, I pretty much cried like a baby. But now it's back, baby! New and --supposedly-- improved! Maria was kind enough to treat me today. The recipe change was obvious. The cheese was the first major difference I noticed. I love Asiago. It's why I tried the original soup to begin with, and I think it really added something. This new cheese is...boring. It's blander. Mine wasn't even melted when it was served, but did melt when I stirred it in. It didn't detract from the soup, but it certainly didn't add anything the way the Asiago had done. The croutons, too, are different. I think I might actually like the new ones better. They're supposed to be black pepper seasoned, but I didn't taste any of that. To me they tasted just like normal homemade croutons, which is good because I'm not a huge black pepper fan. There was always something I found a little but unpleasant about the taste of the old croutons. About the new croutons, I have no complaints. As for the soup....it's not the same as it had been. It's certainly not bad. I might have been given a bum serving, but there was very little broth in mine. It was dense with onions and croutons and cheese, but very little actual broth to speak of. Flavor-wise it was certainly tasty, but the old soup was richer in flavor, at least in my opinion. The new stuff is still savory and oniony, but nothing to write home about. Overall I am a little disappointed. That said, it's still going to be my regular order at Panera. It may not be as satisfying or comforting to eat, but it's still surely going to be my regular order. To make a long story short, it's no longer my favorite and beloved French Onion soup, but it will probably still be my favorite Panera menu item. If you want to be an awesome person and thank my sister for her guest review, you can check out her pixel-based art HERE. I also really digged the old French Onion soup. However, upon trying the new version, thought it to be waaaaay too salty! I couldn't even finish the bowl. It was like sipping salty, onion water with a hint of beef broth. Looks like I'll either have to make my own or go elsewhere for good soup. It's such a pity it's changed. There are a bunch of DIY recipes online trying to recreate the old soup, maybe that's our best bet for recapturing the onion-y magic. I agree with both Sarah and Maria. The new Bistro French Onion soup at Panera's is a disappointment as opposed to the old French Onion soup. 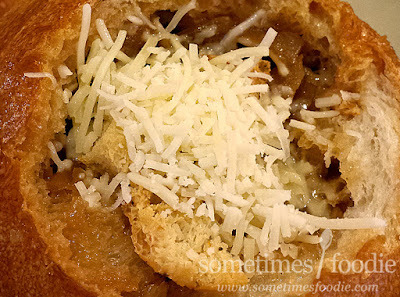 Panera should bring back the old French Onion recipe.